Shield Therapeutics is a specialty pharmaceutical company focused on the development and commercialisation of products created to address areas of previously unmet medical need. We have been working with Shield since early 2015 and have been involved in multiple projects since our initial meeting with them. 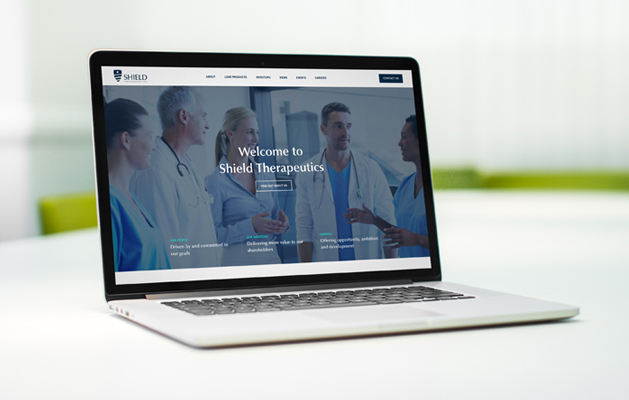 The company has gone from strength to strength in this time and we’re proud to say we’ve recently launched their new website, www.ShieldTherapeutics.com, which is certainly a big jump from the last one. To begin with the old site design just wasn’t cutting it in terms of effectively reflecting where the company was at, and where they were headed. With their first drug approved and a second on the way this is a company that was on the brink of more success and they needed a much slicker online presence to carry them into this next phase. At the start of 2016 Shield Therapeutics successfully floated on the AIM of the London Stock Exchange and this meant big changes for ShieldTherapeutics.com too. The site now required a lot of investor information, live feeds to show up-to-the-minute share prices and RNS news, corporate documents and heaps of other important legal stuff. As a quick fix this had to be crow-barred into a series of pages in the old site but the luxury of starting from scratch with a bespoke design is that we were able to create a full Investor section, purpose-built to hold all that Shield need to display, while hopefully also providing space for any additions. The other main focus for the new site was to be the Careers section. With such a bright future ahead of them Shield Therapeutics had their sights set on expansion. The recruitment of the very best people in the Pharma industry would be paramount to this. To attract those people, and make it easy for them to find their new role, we designed and built areas to promote Shield’s values, team, company ethos and opportunities. The new site far better suits their business and their brand, especially since the IPO, and now begins to introduce their products to their users. We’ve enjoyed being part of Shield’s development to date and look forward to growing with them in the future. If you’re in the market for a new website why not drop us a line.